I don't know how they did it, but an eagle-eyed Walmart cashier in Lexington, Kentucky North Carolina somehow managed to foil Michael Anthony Fuller's attempt to pay for a purchase with a $1 million bill he made. Maybe he didn't get the watermarks exactly right? And it's not like Fuller attempted to buy a million dollars worth of merchandise. Instead, he got to the checkout with a vacuum, a microwave, and a few other items totaling just $476. The store called the police, and later Fuller was charged with two felonies: attempting to obtain property by false pretense, and uttering a forged instrument. Unknown to him, in 1969 the US government had discontinued the $500, $1,000, $5,000, and $10,000 bills. 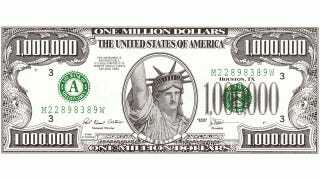 And the largest bill ever produced was a $100,000 note used by Federal Reserve Banks.